The ZTE Blade V8 Lite is true to its name, offering a smartphone that's light on powerful specs but provides a more than adequately bright 1080p display. It's going to be affordable when it launches in Italy, Germany and Spain, and it's aiming to rival the Moto G5 with its budget-friendly features and design. The ZTE Blade V8 Lite has a very fitting name, as it's lighter on some specs and being touted as a smartphone for the younger generation. It's still packing some noteworthy specs and software. It runs Google's latest operating system, Android 7.0 Nougat, while some other phones are waiting for the big update. It also has a Full HD display, giving you a bright, pixel-filled screen in a one-hand-friendly Android smartphone. It won't be an option in the US or UK, as least not initially, as it's destined for Spain, Italy and Germany from the outset. You're also going to want to look elsewhere – like at the ZTE Blade V8 Pro or the ZTE Blade V8 Mini – if you want a stronger dual-lens camera or more powerful processor. But this phone should attract casual smartphone buyers who want the basics. 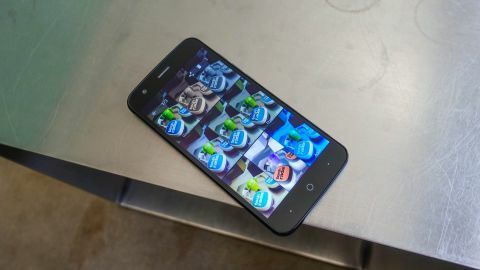 The ZTE Blade V8 Lite feels pricier than it likely will be, with a one-hand-friendly design that measures 143 x 71 x 8mm. Its plastic build looks and feels solid, and it comes with a fingerprint sensor pad on the back – budget phones are increasingly getting what were flagship features in more expensive handsets just a few years ago. What's really impressive is the 5-inch display. It's 1080p and bright, an always important trait when looking at a smartphone outdoors in sunlight. The Full HD screen is highlighted by ZTE's great selection of wallpapers, and they're used to properly show off the high (for a budget phone) pixel count. It's not going to be enough to support VR – you're going to have to upgrade to the ZTE Axon 7 for Google Daydream VR capabilities, but it's adequate for most everyday uses. The rest of the specs focus on affordability, with a respectable Helio P10 MTK 6750 octa-core chipset made by Mediatek and 2GB of RAM. There's 16GB of internal storage as well as a microSD slot if you need more. The cameras are a single 8MP lens on the back and 5MP front-facing snapper on the front. You're going to get all-day battery life from the 2,500mAh capacity battery, according to ZTE – our final ZTE Blade V8 Lite review will determine that. The ZTE Blade V8 Lite is the more lightweight version of the ZTE Blade V8 Pro. It gives you the basics and doesn't try to add a fancy camera or processor. This is a smartphone for people who want to upgrade their calls and data to something a little more impressive than the cheapest phones out there. It can handle games – but maybe not the maybe intensive 3D games on the Google Play Store. What's remarkable is that it gives you the new Android 7.0 Nougat update for what's expected to be a reasonable price when the ZTE Blade V8 Lite launches in Italy, Germany and Spain initially. And it doesn't cheap on the on the Full HD display if you're looking for a good-looking screen without paying a lot of money. We'll see how this stacks up to our best cheap phones list, including the new Moto G5, in a few weeks when it launches after MWC 2017.